Before the discovery of hydroelectricity, man was already finding new and ingenious ways to utilise the energy of running water across the world that would form the platform for our power stations. As with a number of renewable technologies our ancient ancestors were often at the forefront of innovation using it to create mills to grind corn and wheat and even power their furnaces. In ancient Mesopotamia and Greece, over 6,000 years ago, they were developing irrigation and devices such as water clocks, one of the oldest time measuring instruments. In about 1,000 BC the Persians developed Qanat technology that used long, narrow channels or tunnels that ran almost vertically to provide water for local populations. Around the same time the Ancient Chinese were doing something similar in the Turpan region of their country. We have the Greeks and the Romans to thank for the development of the water mill which became a staple technology for communities across the globe and is still in use in many parts of the world today. Our earliest physical remains of such a device being used is in the 3rd Century BC in Perachora in Greece but there is written evidence of it being used as far back as 240 BC. This valuable technology, probably one of the first renewable energies in human existence, spread rapidly and, in 1 AD we know there was a settlement in France that had multiple mills working to grind wheat into flour. 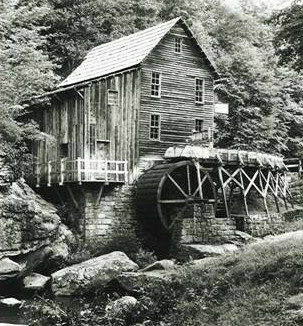 As time progressed, so water mills began to be used for more industrial processes such as cutting wood and marble. In China it was being used to drive bellows for smelting and other industrial processes. We know from documents like the Doomsday Book that there were many water mills in Britain – over five and a half thousand. But by the 12th Century this had risen to a staggering 10-15,000, spreading over to Ireland where they were also developing mills that were powered by the tides. During the 1700s and 1800s the rise of the industrial revolution produced significant scientific and technological developments and prime amongst these was the invention of the water turbine. In the mid-18th Century the seminal work on water turbines was Bernard Forest de Bélidor’s Architecture Hydraulique which talked about vertical and horizontal axis hydraulics. The development that changed everything and provided a brand new power source was the generation of electricity – following on from Michael Faraday’s principals and theories in the early 19th Century and progressing through to the dynamo developed independently by both Sir Charles Wheatstone in the UK and Sam Varley in the United States. England was also the site of the first hydroelectric power machine in Northumberland, created by William Armstrong and used to provide electricity for a single lamp in 1878. But it is in Niagara that we find the first major step in full scale power production with the Schoelkopf Power Station that began pushing out electrical current just three years later. It caused a major surge in building and by the end of 1890 there were almost 200 power stations alone across North America (the US is still the world’s biggest producer of hydroelectric power). In fact, by the time we reach the 1940s, nearly 40% of power in the US was produced by hydroelectricity. Huge concrete monuments were built like the Hoover and Grand Coulee Dams. Hydroelectric power was often referred to as white coal but its influence declined in later years as coal, oil and nuclear power became the technology of choice across the world. Find out how hydroelectric power is produced. With its mountainous terrain and high reservoirs, the UK is a great place for building hydroelectric power stations. Across England, Wales and Scotland hydroelectricity produces around 1.65 GW of energy which accounts for approximately 1.8% of our national capacity. Most of the current stations were built around the 50s and 60s and recent development has been hampered by concerns over environmental issues. Many sites for hydroelectric power are in areas of protected natural beauty and the cost of construction is often considered prohibitive. Dinorwig Power Station in North Wales, producing 1,800 MW. Lochaber in the Highlands of Scotland produces 84,000 kW and which has recently been given go ahead for a new 600 MW installation. Beeston Weir in Nottinghamshire is currently the largest river driven hydroelectric power station in the country. It’s not just large scale electricity production that matters with hydroelectric power. With the need to find new and renewable technologies to reduce our dependence on fossil fuels we are also beginning to look at micro solutions, smaller designs that often deliver in the range of 50-100 kW and can be used to provide energy for a single property. Find out more about micro hydroelectric generation. The major area of development in recent years has been the growth in research on utilising the power of our seas to provide electricity. Still in its early stages, the technology may well revolutionise our power supply in the years to come. Find out more about the different types of hydroelectric systems.